Cut full width fabric and fat quarters into the most popular pre-cuts on the market: 1.5 and 2.5 inch strips, 5 and 10 inch squares. This ruler makes cutting a no-brainer! Need to cut in 1/4 inch increments? 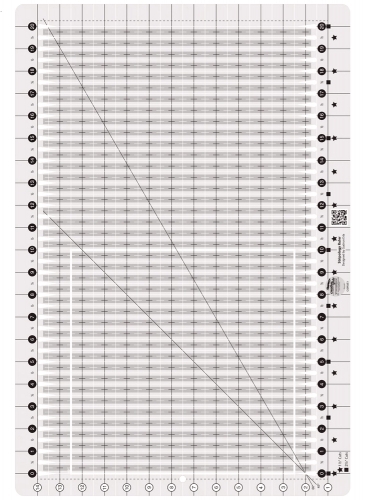 No problem - just follow the chart included in the instructions and use the 1/4 inch line on the ruler. The ruler slides easily over the fabric until pressure is applied. Then, our exclusive gripper holds the fabric in place while cutting, eliminating slipping and miss-cuts! Measures 22"x15"